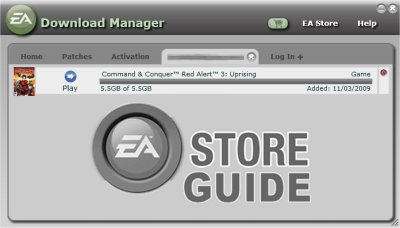 Red Alert 3 Uprising is only available via download, it is prudent to consolidate some information that has gathered over the years about the EA Store, the EA Download Manager (EADM) and Digital Rights Management (DRM) and how they all affect C&C titles. Unlike other game download sites, the EA Store only lets you re-download your games for 1 year as standard. This means that if you buy a new computer in 2 years time and want to re-download your game, you cannot. You can extend this time limit to 5 years by purchasing “Extended Download Service”. However you can backup the game to a DVD, instructions can be found below. There is a limit on the number of times that you can download the game during its lifetime. The figure is not documented, but reports put it at around the 5 downloads mark. Every time you click the download button in EADM will increase your download count by 1. Also if you have installed on more than three computers within a ten day period, you will need to wait until the first installation expires. 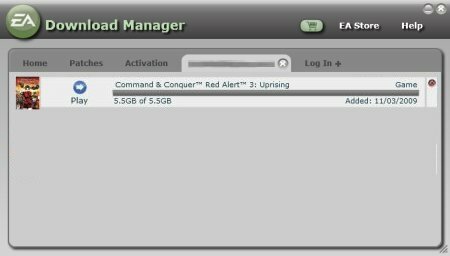 Red Alert 3 and Uprising both use the on-line activation based authentication system (whereas previous games used disk-based). You can install the game on 5 different computers, if you wish to install it on a 6th, you must first de-authorise one computer using the de-authorisation tool in the settings menu. You can install/uninstall the game unlimited times on an activated computer. Reinstalling Windows or making a major hardware change will count as an authorisation. In your cache directory, there will be a folder with some numbers, this contains the contents of the game’s DVD (as if you had bought a physical copy). Do not disclose these numbers to anyone, they are sensitive. In this guide the uprising folder is suffixed with _dd.zip, this may differ depending on your region XP: You will now need to use your DVD burning software (such as Nero or Cyberlink) as XP does not have built in support for this. 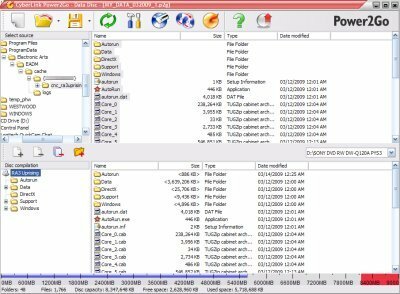 Vista: Select the entire contents of the directory and click the Burn button, this will prepare your files for writing to a DVD. Note: C&C games are too large to fit onto a standard DVD so you will need to use a Dual-Layered DVD. The game will then burn to the DVD and you will be able to use it to re-install your game in future! If you wish you can now delete these ‘temporary files’ from your PC to free up 5.5GB of disk space. All you have to do is click the red X on the right hand side of the game title in the EADM. Reinstalling from the DVD isn’t quite as straight forward as simply running the installer form the CD. That will ask you for a CD key, which you don’t get with the EADM! 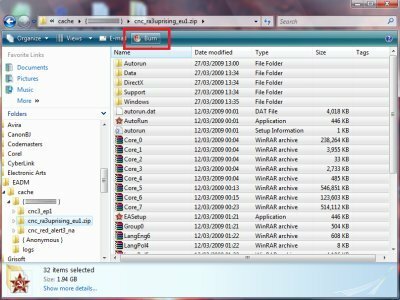 In this guide the uprising folder is suffixed with _dd.zip, this may differ depending on your region. Now open the EADM and you will see the light blue install button, click it to re-install the game.